Welcome to Bunnies' Salad Bar & Grill. Shortly after our family moved from the north side of Chicago to the southwest suburbs, I first heard stories about Resurrection Mary. According to legend Mary was buried in Resurrection Cemetery, only blocks from our new home. You may have heard of Mary. This local legend has become famous worldwide, and the purported sightings of her continue to this day. Although it's been subsequently remodeled and expanded, the O'Henry Ballroom still stands, renamed Willowbrook Ballroom, and remains a popular dance venue in Chicago's southwest suburbs. What greater thing is there for two human souls than to feel that they are joined together to strengthen each other in all labour, to minister to each other in all sorrow, to share with each other in all gladness, to be one with each other in the silent unspoken memories. Shortly after our arrival at the small potato farm, M&M (Mom and her Gardening Buddy,) are first to notice the old barn. Walking down the lane hand in hand, they're off for a closer look. I'm so glad they found each other. They go together like peas and carrots. M&M's driveway cuts a swath through the forest, and offers lovely peeks into the woods. Beautiful in every season, I love taking walks along the steep, nearly mile-long paved drive and enjoying the scenery. The fall colors were beautiful. Look but don't touch! I think these are poison ivy berries. Oak leaves, with white birches in the background. The wild grape vines were a pretty, almost irridescent peachy-pink with touches of green. Who ever said silver and gold don't go well together? This was the first time I'd visited M&M in October, but hopefully not the last. 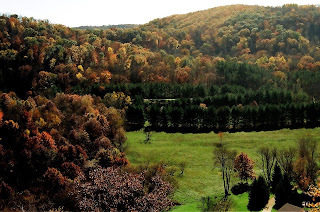 It's a beautiful time of year in the Wisconsin Driftless region. Here in the south suburbs of Chicago we haven't yet had our first frost, although we do expect to be hit tonight. This is the first time I can remember snow before the first frost. This must be some kind of trick - it's certainly no treat! When visiting the small potato farm owned by friends of M&M, we were free to explore the property. I felt like a kid exploring an enchanted forest. There were several paths to walk on the property, and you didn't know what might be around the next bend. Imagine my delight stumbling upon this old graveyard, established long before the current owners bought their lovely property. They're reminders of those who came before us. Old graveyards are rich with history. I love the timeworn character of the monuments. Next to the barn that now graces the header above, the old graveyard was my favorite spot. I found myself drawn to it more than once during our visit. Headstones identify the dear departed. I can't help wondering what their lives were like. Some people think old graveyards are haunted. I think they're enchanted, and enchanting. Linda, I loved the photos you took during your visit, and which you shared in "Small Potatoes". Here are two photos of our hills from the lookout point. 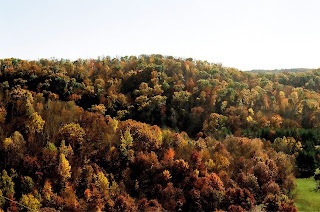 They were taken by your sister-in-law during peak color and are two of my favorite fall photos of our land. This photo is of our "lower 40" valley meadow and ridges. This is a view of the ridges, with a bit of meadow showing on the lower right. The meadows bloom with wild flowers of all sorts from early spring into fall. We keep parts of it mowed and use the mowings as mulch on our vegetable gardens. This past week has been "leaf rain" week, and my Gardening Buddy has been picking them up and piling them on the gardens for their winter blanket. We've had a couple of light frosts with more to come. The 'life-changing garlic" has been planted, and today we are bringing in the last of the beets, carrots, and digging up the sweet potatoes. The brussels sprouts and kale will follow before the ground freezes. Two weekends ago while visiting M&M (Mom and her Garden Buddy,) the girls and I were invited to come along to an open house at the home and potato farm of friends of my parents. Their property, like M&Ms,' is located on one of the ancient, flattened tops of the Ocooch Mountains in southwest Wisconsin. Their property is enchanting. There were wonderful things to look at on every path at every turn, and I did lots of exploring. The open house was attended by a fascinating group of folks, including the hosts. The man of the house is an entomologist, and the woman of the house is a large animal veterinarian. Their young-adult sons were as interesting and interested as their parents. The whole family were wonderful hosts. The other guests were an eclectic, intelligent group of young and old folks including a used book seller, a couple of teachers, and a wedding minister. Conversations were lively, articulate, sometimes controversial, and always open-minded and friendly. The views from their mountain top were beautiful, including this view of a neighboring farm. During my exploration, I came across this piece of old, lichen-covered wood sprinkled with colorful leaves. It was a photo begging to be taken. Shortly after our arrival, we were treated to a tour of the potato fields. The property is about fifty acres, and four of them are devoted to potato fields. These are not your ordinary potatoes - they're the little gourmet baby and fingerling potatoes that come in about every color of the rainbow. The potatoes are sold at a farmers' market in a larger town a ways south of here. Please indulge me - I couldn't decide which of the two tractor shots to post, so I posted them both! I like the tractor more close up, but I liked this one with the wider vista too. Besides the screened in back porch with a beautiful forest view, (which I didn't photograph,) there were a couple of other spots on this property that were simply enchanting. I'll share more from the small potato farm open house in a future post. The home my mom and her husband/gardening buddy (M&M) bought in Wisconsin had been previously owned by an avid gardener. Their first spring in their new home, about 15 years ago, a few plants popped up in the garden that mystified and delighted us. It was something I'd never seen or heard or before. The large, distinctive, sweet-smelling blooms were gorgeous. Mom asked me if I knew what it was. I didn't, but was determined to find out. So I did some research and discovered they were brugmansias, plants that are definitely not hardy in M&M's zone 4 garden. They must have self-seeded from the previous year. They didn't reseed the following year, and since then there have been no more brugmansia volunteers in their garden. Since first discovering them in M&M's garden, I've lusted after these beautiful, fragrant blooming plants. In all the years since, I'd never seen a brugmansia for sale in any of the nurseries around here, although I'd seen them in mail order catalogs. I never got one, as all parts of brugmansias are poisonous. Since our plant-eating cats have left home with my daughters as they struck out on their own after college, it's now safe to overwinter these tender plants inside. Last year at the end of the season at the nursery, a coworker brought in two brugmansias she'd bought in the spring. She didn't want to overwinter them inside, and rather than let them die she brought them to work to give away. I was lucky enough to be able to take one of them home in exchange for some cuttings Mom & Pop, the nursery owners propagated to sell this year. Realizing how easy they were to start from cuttings, I started a new one myself in case the mother plant didn't make it over the winter in our basement greenhouse. Both plants made it through the winter, and an un-variegated seedling or sucker had also grown in the pot of the mother plant. This spring I removed the sucker and put it in its own container. I tried all three plants in the sunniest part of our shady back yard garden hoping they'd bloom. They never did. Although I enjoyed the beautiful foliage, I wanted those huge, fragrant blooms! In early September I moved the brugs to our sunny front yard. A few weeks later they were budding. Pulling into the driveway after our weekend trip to Mom's recently, I was delighted to see the buds had opened. The brugs are now safely ensconced inside. I just couldn't put these blooming beauties in the basement! They're in sunny windows in our living room now. Every evening as the sun goes down, their gorgeous scent intensifies. They perfume the entire house all evening, and in the morning until the sun comes up. Every time I pass by the living room, I'm compelled to go in there and breathe deeply. Commonly known as Angel's trumpets for the shape of their blooms, brugmansias are also aptly named for their heavenly scent! I overwinter double impatiens inside and take cuttings from them over the winter. They're easy to start from cuttings. Yesterday the last of the hanging baskets they're in were brought in to our basement greenhouse. It 'bout killed me to pull off all the blooms, but they're just too messy in the basement. Working on the patio table, I picked them off and piled them on the table one by one. An old girl scout craft project must have popped into my head, and I picked up some of the colorful leaves that have fallen in the yard, and before I knew it, I had this bouquet. I should have been working on the garden, but you know how it is. . . there's something about autumn that brings out the kid in me! I didn't get everything done that I wanted to, but at least all the tender plants are now inside, spared from the frost that will likely be here any day now. Here we are, back for one last look at the Anderson Japanese Gardens in Rockford, Illinois. I hope you've enjoyed our visit. I love seeing something new, or identifying something I recognize but don't have a name for. This soft, bright green conifer was new to me. I looked in vain for a label. Does anyone know what it is? It was beautiful. When I see Aspens, I think Colorado, one of my favorite states. An American Cranberry bush Viburnum is past its peak. I have a baby that's about a foot tall added to the garden this summer. This native shrub and its cultivars have beautiful lacecap flowers in spring as well as nice fall color and showy, edible berries persisting throughout the fall. There are a number of water features in the gardens including ponds, waterfalls, and this creek. The visitor guide doesn't identify the creek. Since the gardens are located on Spring Creek Road, it might be a safe guess that this is Spring Creek. It bisects the gardens east to west. There are three picturesque pedestrian bridges connecting the two sections. Speaking of waterfalls. . . The gardens look like they'd be beautiful in all seasons, and I hope to experience each. Only about 8 miles off the interstate, half way to Mom's, it will be a frequent stop in the future. Last weekend my two oldest daughters and I visited Anderson Japanese Gardens in Rockford, IL on our way to visit my mom and her Garden Buddy. Here are a few more shots from this lovely, tranquil spot. The gift shop sells food for the Koi. The ducks enjoy the fish food too! There were several people feeding the fish, including some delighted young children. I was struck by how much the children I saw seemed to enjoy this garden. Couldn't resist getting a shot of this gorgeous Maple. There were lots of pretty, peaceful seating areas like this one throughout the gardens. There were views like this around every corner. We didn't stay long enough to see the entire grounds, and that gives me good reason to stop here again on future trips to Mom's. The location of the gardens almost exactly 1/2 way between my house and Mom's makes it a perfect place to stop and stretch our legs with a stroll through a beautiful garden. The onsite restaurant serves delicious, authentic Asian food and makes a much nicer place to stop for lunch than the usual roadside fast food joints. Last weekend my two oldest daughters and I headed back up to southwestern Wisconsin for another visit with my parents. We had gorgeous weather, and the fall colors in the region were near peak. On the way to their place we stopped in Rockford, IL to see the Anderson Japanese Gardens we'd heard so much about. The fall colors were gorgeous. Unfortunately there was a huge population of yellow jackets, and since the Middle One is highly sensitive to wasp stings we had to cut our visit short. We did stay long enough for a quick tour and a delicious lunch, and long enough for us to snap some quick shots of this beautiful place. Only a few miles out of the way from our journey to Mom's, I'm sure I'll make these beautiful gardens a frequent rest stop during future visits to Wisconsin.